New Volunteers: Volunteer Orientation Calendar! 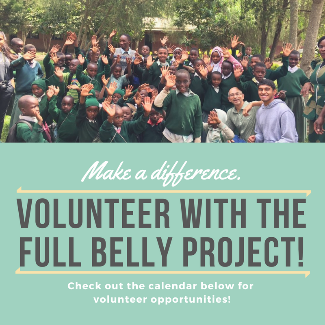 So, you wanna volunteer with Full Belly, huh? Awesome! We would love to have you join our team! There are many different ways that you can support our work through volunteering, and different times in the year can sometimes require different kinds of help! What is a Volunteer Orientation Day and why do I need to attend? This is how we really include you into our team and help set you up for success with volunteering! By attending an orientation day, we can give you a tour of our office/workshop, introduce you to some inspiring volunteer veterans, and explore the different ways that you can help out! So, please look over our calendar below and select one of the upcoming dates for your orientation! Any questions? No problem! Just contact us at [email protected] or 910-452-0275.